Franklin, TN: Tennessee Soccer Club hosted its inaugural Casino Night fundraising event at Quattro Evento in Nashville on Friday night. Beginning at 6:00pm, all 115+ guests in attendance were treated to a cocktail hour along with dinner provided by both Blue Moon BBQ and Qdoba. The Casino games began at 7:00pm and lasted through 9:30pm. Attendees enjoyed games of Black Jack, Craps and Roulette with professional casino dealers. 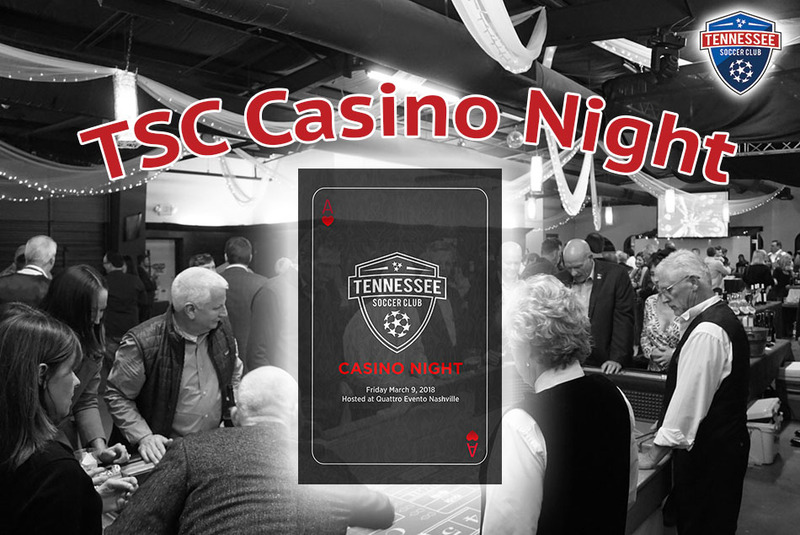 "The Inaugural TSC Casino Night was a big hit and will be a big annual event moving forward," said TSC Tournament Director and Events Coordinator Jimmy Drain. "Everyone enjoyed great food and beverage as well as a fun atmosphere while celebrating Tennessee Soccer Club. This event will grow in the future and we hope to see more TSC members next time." An additional and exciting fundraising component throughout the event was a silent auction with dozens of items up for bid. Items ranged from signed sports memorabilia, free hotel stays, jewelry from local jewelers and gift cards to Nashville-area restaurants. All funds raised throughout the evening support TSC's mission of promoting a love for soccer in the community. TSC would like to thank everyone who attended the event. Thanks to Joshua Lykins and Elite Events of Music City, and a special thanks to Quattro Evento for donating their event space for the night to take place!